When you’re at Vegas, everyone likes to double down at the blackjack tables. And double your money coupons are a good thing at the supermarket. It’s interesting, considering their prevalence, that the aesthetic industry has basically overlooked double chins. To do anything about a double chin, patients have had to resort to neck lifts or lower facelifts. But that has changed with a brand new product called Kybella®, a prescription brand name injection offered by Dr. Kearney. Kybella® is the prescription brand name for an injection formulated with deoxycholic acid that dramatically improves the appearance and profile of moderate to severe fat below the chin, the proverbial double chin. People like to think others have the double chins, but that’s not true. The American Society for Dermatologic Surgery conducted a survey in 2015 and found that 67% of people said they’re bothered by a double chin. That’s two thirds of the country! Respondents also said their double chins bugged them just as much as their wrinkles and other signs of aging. Gravity, simple intrinsic aging (where decreasing production of collagen means the skin has less underlying support), genetics (some people simply have looser skin below the jawline), and weight gain — all of these factors cause our skin to droop. And because the skin under the chin has no underlying bone or muscle beneath it, it’s even more obvious when it becomes lax and hangs downward. In April 2015 the FDA approved Kybella®, the only injectable treatment to improve the appearance and profile of a double chin. The basis of Kybella® is deoxycholic acid. Deoxycholic acid is a naturally occurring molecule in the body whose job is to aid in the breakdown and absorption of dietary fat. When injected into the fat beneath the chin, Kybella® (and its deoxycholic acid) destroys the fat cells. After those cells are gone, there is no longer a storage mechanism to accumulate fat in the area. Once gone, your double chin shouldn’t return. 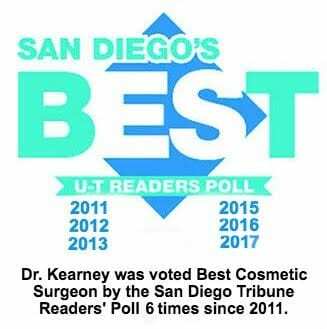 Dr. Kearney customizes his Kybella® treatments. Some patients see the results they want after two to four treatments; others require six. The number of treatments will depend on the amount of fat stored under your chin, along with your desired final profile. Each treatment is spaced four weeks apart. Because Kybella® destroys the fat cells, results are permanent. However, if you gain weight, submental fat can return. So, leave the doubles to Ichiro Suzuki. Let Dr. Kearney put the beatdown on your double chin with Kybella. Call him at 800-671-1951 and ask us about it.